Sunday was such a beautiful day. Yesterday I really had a chance to reflect on the different communities we're involved in. It was "Welcome Sunday" at church - the Sunday that kicks off the fall schedule and welcomes both new members and those who had spotty attendance when summer got the best of them (ahem). It's a beautiful church - quintessential New England. 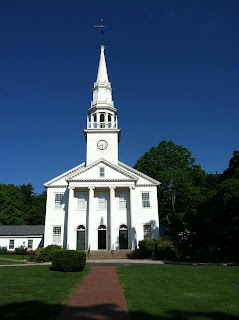 On days like today, when the sky is bright blue and the trees are still full and green, it looks like a postcard - white steeple rising up on the town green. We take a yearly photograph of the congregation and we've been lucky to get some beautiful days. I remember our first experience with "Welcome Sunday" at our church. We joined this particular church about a month before Madison was born. Adam and I, for various reasons, hadn't settled on a "home church" until that point, but it was important for us to find a place for our family. We attended for a few weeks. People were friendly and welcoming, we loved the minister immediately, and knew it would be a good choice. Then Madison was born and our world was thrown upside down for a few weeks. We didn't make it out on a Sunday morning for those first few weeks, but we were determined to make it to this special Sunday. And we did. We brought a sleeping Madison and she slept in her carrier for the entire service. It was a cool day, and when we stepped outside to take the church photo afterwards we joined several other new parents sheltering their newborns from the fall breeze. We compared birthdays and were overjoyed to find that our little girls had been born within weeks of each other and would grow up in the church together. We discussed leaving our babies in the nursery and chatted about the difficulty of getting out of the house with newborns. That was the day we knew we'd found our church family. There on the steps, meeting Madison's future friends and enjoying all the cooing over the littlest members. It reminded me of a Sunday in September 1997. I was a freshman in college. I'd been on campus a week and hadn't quite settled into this new life yet. I wasn't a party girl, I was friendly but not overly outgoing, and though I'd met a few people (several of whom did turn into true friends), I wasn't yet busy on the weekends with things to do. That first Sunday I decided to go to church. I'm not sure why. I was up and didn't know what else to do...I'd been going my entire life and didn't know another way to spend Sunday morning...it was a link to home...it was another place to meet people...I'm sure all of those scenarios played a part in my decision. I sat down in the Episcopal church. I was disappointed to see that the congregation was reminiscent of home - families, grandparents, not a college kid in the bunch. By the way, this COMPLETELY surprised me. I'm not sure why. I sat alone and let the familiar service wash over me, feeling both comforted and homesick. I remember that Princess Diana had recently died, and with the Episcopal Church's tie to England, that was a focus of the prayers and the service. By the ending hymn I know I had tears in my eyes - and it wasn't from mourning. I didn't know if I had it in me to attend and sit alone weekly, but the idea of letting go didn't seem right at the moment either. I'm not sure if they'd already marked me from the moment I sat down or if it was at one of my teary moments. But as I stood to leave I was approached by no less than three smiling groups of faces. They welcomed me to the university, the town, and the church. They asked about my hometown, my plans, myself. One woman decided to have an impromptu lunch at her house and insisted I join them. I spent that beautiful fall afternoon eating sandwiches and salads and talking with some truly friendly people. Although I didn't stay at that particular church long - I eventually found my "tribe" in college and a smaller group attended a different church off campus - they have always stayed with me. In the beginning of September, they made sure to be truly welcoming to someone new, who had literally wandered in, alone and looking for a place that felt like home. Yesterday, as we experienced our third "Welcome Sunday", I reflected on this, and how we've grown with our church family. That original group of three infants? Three preschoolers, three toddlers and a newborn. Still all girls. Three little girls held each other's hands as they took those first tentative steps away from the nursery and into the Pre-K classroom in the church basement. Our church celebrated with members of the Temple next door - when they realized their space had become too small for their High Holy Day services, they found a home in ours. They walked from their space to ours, where members of our congregation were waiting with apples and honey. The rabbi and a few other members attended our "Welcome Sunday" as a gesture of gratitude. What a wonderful way to connect the two traditions. And the music today lifted my spirit...and moved my three year old to tears. Ok, she was on the verge of tears ANYWAY with her new routine, but it was the singing that started them flowing. Welcome home indeed. I hope that my girls will take these experiences, no matter where life takes them, and always feel welcome and at home in church.